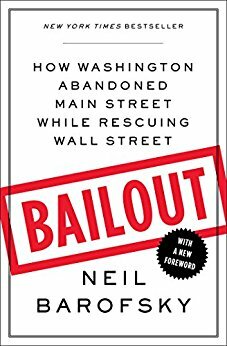 In 2008 the US Congress approved what would become an open checkbook to “bailout” Wall Street and its counterparties from losses resulting from a more than a decade long epidemic of predatory lending and mortgage and related securities fraud. One condition was the appointment of a Special Inspector General (SIGTARP) overseeing the Troubled Assets Relief Program (TARP) at the US Department of Treasury who was required to report to Congress. This was a painful book to read. I remember what it was like being in Barofsky’s shoes. As a government official, you are trying to align the flow of government actions and resources with the stated goals of the authorizing laws and related regulations and public official announcements. Inotherwards, you are trying to serve the best interests of your country and fellow citizens. The problem is that the real goals of what is happening are unspoken and are entirely outside of, if not contradictory, to the stated goals. You are operating in a state of financial “multiple personality disorder.” If you try to instill accountability, the result is a dazzling array of tactics to ensure that the covert goals are primary. These tactics include refusal to provide coherent disclosure, failure to publish audited financial statements as required by law, refusal to publish lucrative contracts and contract budgets, public obfuscations, material omissions, lies, complexification, personal attacks, feigned incompetency, divide and conquer antics and dirty tricks. Barofsky ran into the buzzsaw of many of them. Nor do I think Barofsky realized at the time that the US government intentionally and systematically engineered the housing bubble that contributed to the financial crisis, including the massive securities fraud that lead to the financial crisis and bailouts. It was hard work – it took personnel and regulatory changes across the many federal agencies and affiliates involved in financing the US mortgage market. See: Dillon Read & the Aristocracy of Stock Profits. As outrageous as the giveaways by Congress and the Bush II and Obama Administrations were, I suspect it would have been much worse if Barofsky and his team had not been present and active and willing to bring transparency to some of the most outrageous shenanigans by Secretary of Treasury Timothy Geithner and his staff. This matters, because every dollar counts when billions are liberally poured into the likes of AIG and Goldman Sachs and their counterparties. We also owe Barofsky a debt of gratitude for publishing Bailout and for returning to private practice where he is needed to protect private citizens from a government that– in the words of a Senate chief of staff to the Chairman of a Senate appropriation subcommittee for the Department of Housing and Urban Development – is functioning as a criminal enterprise. * Disclosure: Jenner & Block represented my firm Hamilton Securities Group from 1996-1998.